I'll get this out of the way right up front: it's not likely that any Spider-Man movie made now or in the future will ever connect with me on the level that Sam Raimi's Spider-Man and Spider-Man 2 did. For me, they got everything exactly right - the tone, the heart, the casting, the characters. Those movies were my idea of Spider-Man put on film, and it will probably be impossible to ever live up to them, especially since my appreciation for them is enhanced even further because they came out at just the right time in my life. Even though the fact that Spider-Man is now officially part of the Marvel Cinematic Universe makes me very happy, these MCU Spideys still won't be able to match up to the Raimi films for me. That said, Marvel and Sony's Spider-Man partnership that began with the introduction of Tom Holland as Peter Parker / Spider-Man in last year's Captain America: Civil War has resulted in a great film with the MCU Spidey's first solo (sort of) adventure, Spider-Man: Homecoming, which I caught at a drive-in opening weekend, accompanied by my dachshund Zeppelin (who I got on the day I saw Raimi's Spider-Man for the second time back in 2002) and his chihuahua buddy Mr. Jeeves. Homecoming was directed by Jon Watts, and if this guy doesn't have a career trajectory to be envious of I don't know who does. His career path is similar to Sam Raimi's, but he managed to do it in just three films. He made his feature directorial debut with a low budget horror movie, Clown - which happened because Watts put together a faux trailer for the concept and put the line "From the Master of Horror, Eli Roth" in there. When Roth saw the trailer, he agreed to produce the feature. Watts then followed that up with a thriller starring a big name, Kevin Bacon in Cop Car. And from there he landed the Spider-Man gig. Low budget horror, A-lister thriller, superhero movie in just three moves. Yes, I'll have what he's having. Watts is pretty much the same age I am, and he appears to share the fondness I have for the movies and music of the 1980s, because his approach to Homecoming was to blend the styles of MCU superhero films with that of John Hughes' classic tales of high school (Sixteen Candles, The Breakfast Club, Ferris Bueller's Day Off, Pretty in Pink, etc.) Ferris Bueller is even seen on TV at one point, in the middle of a sequence that pays homage to a certain sequence from that film, and Watts assembled a cool soundtrack: "Save It for Later" by The English Beat, "Space Age Love Song" by A Flock of Seagulls, "Going Up the Country" by Canned Heat, "Blitzkrieg Bop" by Ramones, "Can't You Hear Me Knocking" by The Rolling Stones. Crafted by a small army of writers - Watts, Jonathan Goldstein, John Francis Daley, Christopher Ford, Chris McKenna, and Erik Sommers - the script picks up a couple months after Tony Stark / Iron Man (Robert Downey Jr.) took notice of this super-powered kid in Queens, New York and roped him into the middle of the Avengers' disagreements in Civil War. Peter Parker is a 15-year-old sophomore attending Midtown School of Science and Technology, but he's distracted from his extracurricular activities. Dazzled by his brief time in the big leagues and the fact that he was acknowledged by his hero, Peter is regularly suiting up as Spider-Man and fighting small-time crime in Queens while anxiously waiting to hear from Tony, hoping to get another Avengers-level mission. 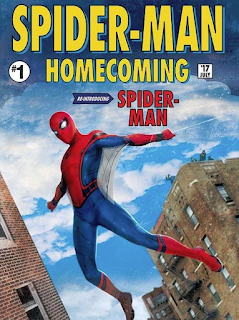 The idea was that Homecoming wouldn't feature scenarios we had seen in any of the five previous Spider-Man films, which includes - thankfully - sparing us from having to sit through the origin story yet again. 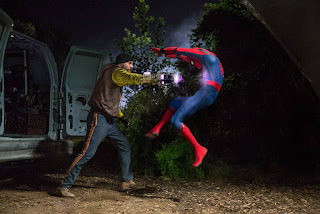 The filmmakers trust that viewers already know how Peter Parker gained his spider-like powers, getting by with just a reference to the bite he received from a radioactive spider bite. His Uncle Ben, the late husband of his Aunt May (Marisa Tomei) gets even less attention. That one is slightly unfortunate, because Ben, his advice, and his fate are a major part of Peter's back story. 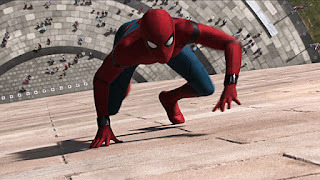 The desire to bring new scenarios to the screen also means that Peter has a different supporting cast of characters that you might expect to see around him, and some characters have been altered and/or de-aged. 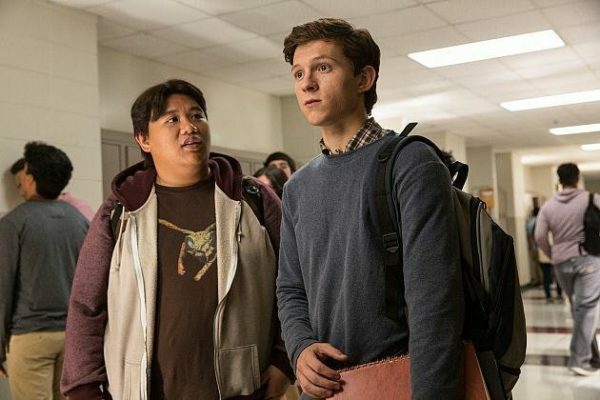 Rather than hanging out with Harry Osborn, this Peter hangs out with classmate Ned (Jacob Batalon), who gets his name from one of Peter's Daily Bugle co-workers in the comics. 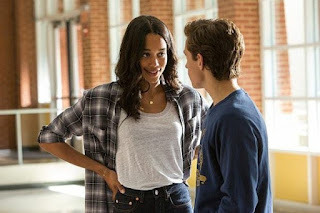 Rather than pursue the more well-known Gwen Stacy or Mary Jane Watson, this Peter has a crush on Liz (Laura Harrier), who gets her name from comic book classmate Liz Allan. A bullying jock in other versions of Spider-Man, "Flash" Thompson (Tony Revolori) is re-imagined here as a member of Peter's academic decathlon team who is always picking on him. Betty Brant, another Daily Bugle co-worker who was Peter's first girlfriend in the comics, is now a fellow student who hosts the high school's news show and is played by The Nice Guys breakout Angourie Rice. Also on the academic decathlon team is Zendaya as Michelle. Spider-Man spent some time with a girl named Michelle Gonzalez in the comics, but we'll come to find out that Michelle is actually this series' version of a different comic character, and the reveal of this was one of my least favorite things about the movie, as it's handled in the same clunky way that we found out Naomie Harris was playing Moneypenny all along in Skyfall. I don't like this sort of thing. But I do like Zendaya as Michelle; she's a lot of fun as this snarky, pain in the neck character. The biggest example of de-aging is the casting of Tomei in the role of Aunt May. It's odd to have such a youthful and attractive actress in the role (Rosemary Harris in the Raimi films is how I think of Aunt May), but Tomei really doesn't get much of a chance to make an impression as May in this film. She was given very little to do. Another supporting character is Tony Stark, and I was worried about the presence of Iron Man going into this film. He was featured quite heavily in the marketing, and I was concerned that he was going to be in the movie too much. I wanted to see a Spider-Man movie, not a Spider-Man and Iron Man team-up movie. If you've read my write-ups on other MCU films, you'll know that I have gotten more than my fill of Iron Man. I'm tired of him and feel like he's been the primary villain of the MCU lately, as he has been the cause of most of the conflicts he and his fellow Avengers have had to deal with. Unintentionally or not, he creates villains. 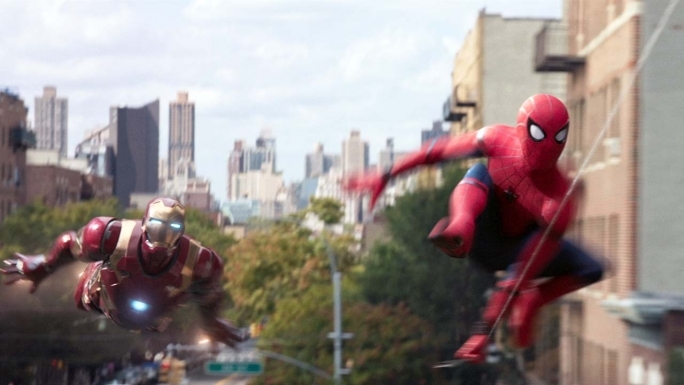 Tony Stark's fingerprints are all over the movie, but thankfully he doesn't push Peter / Spider-Man out of the spotlight. This is very much Peter Parker's story, even if he does chat with Tony or Tony's sidekick Happy Hogan (Jon Favreau) regularly and Iron Man does show up alongside Spider-Man in the field a couple times. Tony's biggest contribution is the fact that he has provided Spider-Man with his suit, giving Peter an upgrade from the crappy homemade hoodie outfit he had before. The suit is very much a Tony Stark product, coming complete with an A.I. that speaks to Peter just like the A.I. Iron Man has in his suit. This was a weird twist, as Spider-Man does not usually have A.I., but it did allow for some humorous moments as Peter talks to the A.I. - which he names Karen and is voiced by Jennifer Connelly - and tries to figure out his suit's capabilities. The Spider-Man of Homecoming is very inexperienced. He has only been swinging around Queens and fighting street level crime for a few months and he's still trying to figure all of this stuff out. He wants to go bigger, but he doesn't want to take the time to build up to it and is frustrated that Tony has put "training wheels" restrictions in his suit. He and Ned, who figures out his secret identity early on, are going to find a way to override those restrictions. Spider-Man gets his chance to prove himself when he realizes that there is a group of criminals selling hi-tech weaponry of alien origin on the streets of Queens. The leader of this group is a man named Adrian Toomes (Michael Keaton), also known as The Vulture due to the winged flight suit he gets around in. Toomes' criminal endeavors go back eight years, to the aftermath of the alien invasion depicted in The Avengers, when he was a contractor hired to clean up battle-ravaged New York City and salvage the alien tech. Just as Toomes was getting to work, his contract was thrown out and he was replaced on the job by an organization spearheaded by Tony Stark and called Damage Control. Damage Control would be cleaning up after Avengers skirmishes and doing the salvaging. So Toomes turned to crime to make his money... and thus the actions of Tony Stark created another villain. 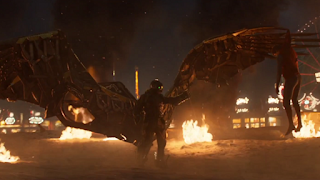 Over the years, Toomes has managed to salvage tech from the Chitauri aliens, pieces of Ultron robots, Crossbones gauntlets, stuff from the Dark Elves... if the Avengers fought someone with extraordinary weaponry, Toomes was there to get his hands on bits and pieces, stealing it right out from under Damage Control's nose. With the help of Phineas Mason a.k.a. Tinkerer (Michael Chernus), Toomes then uses the tech to create all-new weaponry that he will sell to anyone willing to pay the price. Aiding in the arms deals are Jackson Brice (Logan Marshall-Green) and Herman Schultz (Bokeem Woodbine), both of whom take up the mantle of Shocker over the course of the film. Yes, you have four villains from the comic books working together, but it's handled in such a way that it doesn't feel like the movie is over-stuffed, as comic book movies with multiple villains can from time to time. That happens when they put too many major villains together. That's not the case here - Tinkerer and the Shockers are just Vulture's lackeys. They're characters who would have been in the film regardless, since Toomes needs his tech guy and the henchmen for Spidey to beat up, so why not make them recognizable characters? Tinkerer and Shocker would never be able to carry a film themselves, so throw them in as secondary villains. This is something I have always wanted the Spider-Man movies to do. The villains from the page don't always have to be the big bads, some of the lesser ones can get taken down along the way instead of random criminals. There are also appearances by Donald Glover as Aaron Davis (a.k.a. Prowler in the comics) and Michael Mando as Mac Gargan, a criminal with a scorpion tattoo on his neck - a nod to the fact that Gargan is the villain known as Scorpion in the comics. If Spider-Man weren't determined to prove himself, Toomes is the sort of bad guy who could slip through the cracks, as he has been doing for eight years already. He hasn't been detected by the police, he's a bigger threat than Tony thinks Peter should be taking on at this point, but he's too small time for the Avengers to bother with. Well, Spidey becomes determined to thwart his scheme and bring him to justice. The spider bite and Uncle Ben aren't in here, but this is still an origin story of sorts, as we see Spider-Man test his limits and expand his abilities. He messes up a lot, gets in trouble, climbs to heights he has never gone to before. There are several action sequences packed into Homecoming and there's a nice escalation to them, each action scene is bigger than the previous one, going from the streets to Queens to the Washington Monument (Peter's academic decathlon team goes to D.C. for a competition) to a major sequence on the Staten Island Ferry and wrapping up with a massive sequence on an airplane above NYC. The high school side of Peter's life and the heroic after school gig collide toward the end of the film in a fantastic way. The most memorable scene in the movie is of two people talking in a car, the most awesome confrontation between Spider-Man and Vulture is when they're out of costume and having a conversation man to teen. Keaton does a terrific job as Adrian Toomes, making the character a guy you can understand. He's doing criminal things, but you know his motivation for doing these things. You can see his side of it... but at the same time, he can be deeply chilling when he threatens someone who is getting in his way. Spider-Man: Homecoming isn't my idea of a perfect Spider-Man movie; I have some issues with the way certain characters were handled, they could have pulled back even more on Tony Stark and his tech, I'm not sure about the stuff with Karen, etc. But nitpicks aside, it works wonderfully overall and provides 133 minutes of pure fun and entertainment. Spidey's in the MCU now and it's great to have him home.